When we go to photograph an area, we often do a lot of research into which areas are known for specific scenes so that we have an idea of the options of things we can visit. When you live as close to Yosemite as we do, and go as often as we do, we tend to start to learn the area. Driving into the Valley, for example, you can stop at Tunnel View, check out Bridalveil Falls, visit the meadows, look at the reflection of El Capitan in the Merced River, visit the 3 Brothers, or even stop at Swinging Bridge and photograph the Merced River bank. After trying to photograph the 3 Brothers for sunrise we decided we'd head towards Yosemite Lodge for breakfast. Along the way we stopped at Swinging Bridge and decided to see if there was any frozen ice on the side of the Merced River. Not much. Under the bridge, however, was a small patch of frozen river and we made the best of it. I found this branch that was stuck in the ice. It was under the bridge and was the only spot that had frozen along the river. 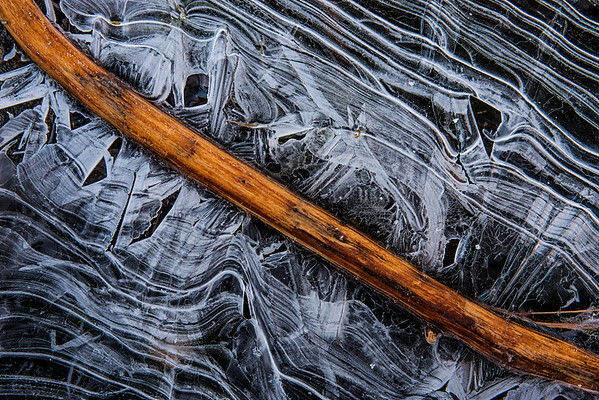 I loved the way the ice formed around the branch and made some amazing patterns, shapes, and veins. Willie and I both photographed it for many minutes (of course he did his photos after he saw mine :P).